I like Pierre Hermé very much. He’s a genius, and his stuff is gorgeous and the fellow deserves all the accolades that are bestowed upon him. He seems like a nice guy and his shops in Paris are swanky as all get-out. His white truffle macaron I found very intriguing. Rather brilliant, actually. And I’m a big fan of his Arabesque, two apricot-flavored disks with a dusting of pistachio and a hint of crunchy croquante in the middle. But this one, I couldn’t eat. Some friends brought over a box of his macarons from his newest shop on the rue Cambon, and as they were running down the list of flavors in the box after dinner, I stopped…and gulped…when they told me what was in this one: foie gras and chocolate. Look, I like foie gras. I like chocolate. But the idea of a sweet cookie combining the two was making my stomach quesy. On a scale of 1-to-10, I would say I’m a solid 5 in terms of being an adventurous eater. I don’t need to try everything that I can, but I’ll eat sea slugs, liver, oysters, barnacles, eels, and other squirmies, but I don’t feel the need to have bragging rights over everything which may remotely be edible.And I’m rarely never inspired to stick anything in my mouth that I’m certain I won’t like. But cookies? I love cookies! There’s very, very few that I don’t like. In fact, I can’t think of one that I don’t. As we worked our way through the box, we finally got to the end, and all that was left was that one lonely red-hued foie gras et chocolat macaron. They insisted I try just a bite, a small bite, and I had to beg off. 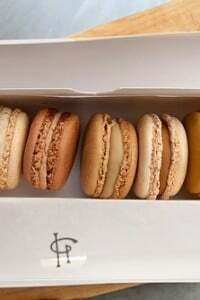 I’ll stick with Monsieur Hermé’s tried-and-true flavors, like caramel à la fleur de sel, café, fruit de la passion et chocolate au lait, and even go out on a limb with a few oddities such as wasabi and grapefruit or the truffe blanche et noisette that fill out the rest of his current collection. But this one I couldn’t eat. Any takers for the last one? Foie gras and chocolate? Why Pierre, why?!?? I was served a foie gras “sorbet” at Per Se last weekend, which I didn’t find pleasing — but I’m always willing to try anything with a little foie mixed in. I’m thinking about making foie gras toothpaste for the real animal lovers out there. David, I simply love Pierre Hermé’s macarons. In my own personal taste test, I really preferred them over Ladurée. My palate is likely not as well-trained as yours, so I’m not sure why I preferred them, but I surely did. BUT….I forgot to say, I am sure I would not PREFER the one you wouldn’t/couldn’t/shouldn’t eat! I’ve eaten some weird things in France, but I would definitely draw the line and foie gras and chocoale cookies. Ew. P.H. wouldn’t put something out there that wasn’t fabulous, would he? But it’s amazing that that combination would even pop into his head. But his mille feuille is to die for! I’m yet to try a P.H. combination of flavours that I dislike but foie gras and chocolate?? Non merci! Today’s installment of “bon appetit bien sur,” on france3 featured seared foie with lots of chocolate and some vinegary sauce with orange and caramel. It sounds whack, but M. Robuchon is not known for having bad taste. I would totally eat that cookie. I might have to try it just out of curiosity but only a little bite. I tried this macaron when I attended PH classes at the Ecole Ferrandi in february. And I have to say, although sceptical myself, they are quite brillant. I wouldn’t say they are good, but the fact that something so small can have so much taste is quite amazing to me. And can you think of something so small that cost sooooo much (not counting an actual truffle , bien sur..) ?? Last time I checked these special edition macarons (truffle/hazelnut, foie-rgas/chocolate) were costing close to 7euros a piece… The man IS a genius!!! Non merci indeed. I used to think I was an adventurous eater, however, the more I read about food the more I realize I am actually quite picky. The rest of the cookies look great! hahahaha…send it to anthony bourdain. Whatever for the cookie. What I like here is that I just expanded my repertoire of French phrases (not a very big list yet) by one very important one. I’m a vegetarian, so I guess that my reaction to this would be obvious! However I also find the color really unappealing – and I’m a red velvet cake lover, so it’s not just that its red, its that a plastic looking mc donalds red. gross. I know it sounds strange to say this about a pastry maker, but Pierre Hermés output, be it the more traditional cakes, or the ‘out-there’ creations like this foie gras one, are too sweet. As my mother always says, “less sugar makes a sweet taste richer”. I’m so with you, David. No foie gras cookies for me. I must admit I’m a philistine — can’t stand the stuff (foie gras, not cookies!!). But I’m not surprised that they came up with this ‘glamorous’ combination. When friends and I did the tasting menu at Robuchon’s La Table (XVIeme) a couple of years ago, I remember that foie gras figured in 5 of the 10 menu items . . . including one of the desserts! I’ve tried some of the Pierre Hermé macarons, but I still prefer Ladurée. And to be honest, I love nothing better than the caramel and the vanilla (not that I’ll refuse other one, excepting licorice!). Great, now I want some macarons! You did the right thing refusing that one. At least you won’t have that taste memory in your consciousness. Ahhhh well, it does have a certain Styrofoam with gold flecks style, doesn’t it? Like a pricey beer cooler. Fois gras is so mild flavored I probably would have tried it, so it’s a good thing I am in truffle world and not goose world. It’s the thought of what the texture of that filling might be like, more than the flavor, that makes me gag a tiny bit. No liver in my macarons, s’il vous plait. i actually tried this combination and loved it. although i have to admit (for whatever reason) it didn’t sound that weird from the beginning: my brain somehow accepted that chocolate, bitter sweet, works with foie gras. they have a stand here at the brussels christmas market selling the most bizarre (on paper) combinations with foie gras – and although pricey! – some are worth for the wow factor alone. Hmmmm, we served foie gras creme brulee at our wedding, which was elegant and divine! I’d probably try it, as sweet usually goes well with foie. I’ve had beignets stuffed w/foie gras and dusted w/unsweetened cocoa powder; the cocoa cuts the richenss of the foie gras. It was delicious. So while I might approach this with caution, I’d definitely try it. I’d eat it. If you can arrange to send it to me in Massachusetts, I’ll not only eat it but blog about the experience! That is a challenging combination. Somethings just don’t belong in your mouth at the same time. However, I’m adventureous enough to take one bite and determine if I think it was brilliantly inspired or plain crazy. I would have eaten it. It sounds like a lovely creamy combination that is making my mouth water just thinking about it. In my house, you would either have a taste of everything on your plate, or NO DESSERT. Not sure how this works when you won’t try the dessert. Also, if you posted that you enjoyed the combination of Foie Gras and Chocolate, I’m sure all of your fans would jump on the bandwagon with the same blind faith most are showing here. ew! although i can’t say much because i have tried horse-meat ice cream in Japan before. oye, pierre herme… we (Japanese people) love your macarons like no other, but sometimes it’s your adventures scare us. Sounds delicious. Dale, do you live in the Boston area? I’ll split it with you! Next time tell your friends to read the list of flavours after the box is empty. I can’t see someone with the stature of Pierre Hermé delivering a duff macaron. BTW, it’s a good thing for you that your friends didn’t bring this box instead. They could have sat there and eaten every single one of them themselves. CM- we might have to split it in thirds! I’d totally want to try some of that as well. Do you know of any good places to get macarons in Boston? For some reason, in my mind foie gras and chocolate makes sense. Maybe I’m just crazy. I am relatively new to your wonderful blog. Some of my favorite posts are shockingly not about food?!?! Like trying to replace the handle bar on your oven or personal banking in France! Frustrating life stories balance out all the delicious goodness of a delectable food blog. So many thanks, and great photography too. I am not a huge foie gras fan. I was 13 years old and spending the summer with my French penpal and her family in Strasbourg when I first tasted the delicacy. I ate all sorts of new and exciting food that summer. Always thinking I knew what it might be but not exactly sure. With a language merkiness as a small obstacle, often vocabulary was mixed with charades to explain a story or in this case a description of what I had just swallowed. Imagine my horror when Papa grandly demonstrated at the restaurant the force feeding of the beautiful goose. I still wonder if anyone has ever tried making foie gras without the forced fattening of the birds? Why not just make feed plentiful and available 24/7, maybe throw in some televisions and sofas and then like Americans they would fatten on their own. But yes, it still tasted good. But if I eat it once a year that is a lot. So no to this cookie for me thank you. I don’t even eat mole sauce since chocolate chicken doesn’t appeal to my sensibilities. A game we play at dinner parties you might like…. “This macaroon was PH’s creation so what might another famous/infamous chef/celebritycook do to compete/out do this dish? Since this is my first time commenting I am going to be so bold as to ask a question too. I have been looking for a salad dressing recipe forever. It is that seemingly simple delicious dressing I get in France or at French bistros worldwide on basic green salads. It is a very light milky mild vinegarette. Any suggestions? I actually made these a couple of years ago in my macaron stage at l’Atelier Pierre Herme in Paris. I, too prefer to keep my foie gras and chocolate separate, but I found the truffle macarons to have more of an off flavor. Of course, the classics and most of the other combinations are to die for. Also, Pierre’s professional recipe and technique are nothing like you will find in a regular cookbook – even his own. I’d eat it in a heartbeat! In my first restaurant job, we served a foie gras flan with a chocolate cracker made from brick paper. It was divine! Sounds like it could work to me, but I’m a fairly adventurous eater. In Girona a couple of years ago, I really enjoyed one of the Roca brothers’ classic dishes at El Cellar de Can Roca: a chocolate covered foie gras bonbon with truffles. Foie gras is complicated. To me, it tastes like wonky butter but stinks like something only cats eat. So, in a way, it wouldn’t be unwelcome in a cookie or pastry, since butter and flour and sugar are fast friends. On the other hand, it might make the cookie taste buttery but smell barfy. I think you made a good call–if you try one in future, attempt it with a clean palate and empty belly! Actually, I should correct myself. The bonbon had a chocolate center and was covered with aspic. Send it here. I would love to try it. Fatemeh and I had foie gras chocolate bon bons at Orson and they were surprisingly delicious. Rich though, for sure. Marc Veyrat had already made Foie Gras and chocolate, albeit not in a cookie. So had some other Food Network personality I don’t recall. I’d definitely try that one. I too have avoided this flavour, though I find the white truffle and noisette one intriguing. I haven’t made it to the shop in a while (even though it’s only 15 minutes from work), so do tell: are there any holiday macarons which you actually want to eat? Have they by any chance brought back the olive one? Wow, I had no idea taste could be so esoteric. I’m sure the fois gras flavor is minimal, but the cachet of the flavour combination is what hooks the consumer. Would you eat Mole when you are in Mexico, a spicy chocolate-based sauce served with meat? It seems to me like this may be a frenchified (no idea if that is a word) version of that combination. I had that Macaron two years ago at Xmas time, and I loved it. I thought the fois was subtle and added some unctuousness to the chocolate. Was it my favorite? No. Would I get it again…sure. I’d have gladly eaten that cookie. Want to ship me some for Xmas? I am fairly adventurous so I’d probably try it, but it would not be my first (nor second, third…) choice. More surprising than the fois gras et chocolat macaron are the oddities from your readers. Fois gras creme brulee? Fois gras flan with chocolate crackers?! Talk about guilding the lily… and not in a good way. I prefer my fois the old-fashioned way: sauteed, served with toast and maybe some kind of fruit condiment, like fig jam. I’m all for adventure, but seriously? When something is that expensive, I don’t want to cover up the taste. I once had at a restaurant in Seattle a Foie Gras sandwich with grape jelly, it was a play on a PBJ. The in this combination the Foie took on the flavor of peanut butter. It was served warm. It was very good. SO I could see how it could be combined with Chocolate. I would try it. BTW they all look very beautiful. I’m going to have to agree with you on this one. I’ll leave the adventurous eating to Andrew Zimmern. I’d try anything PH made and I was sad I missed out on this one. Next time! Okay, David! Quit with the showing us cookies already. How about showing some cookie recipes…hmmmm? We know you have some. Hey, and no punishing us with something impossible either for my smart mouth. Make nice. I don’t like “foie gras” at all (I don’t like the smell and taste of liver) so I wouldn’t try it (because I KNOW I wouldn’t like it) but if you like both, as a foodie, why not try, David??? Try it first and then say it’s not good – if it is. Oh … well then remind me not to make you my famous licorice-squid cookies next time you’re in town. Oh, and? Having the promiscuous palate that I do, I would totally try it. Even if I think it sounds weird and gross. He probably already does make this cookie! What do you think about his creations? And I just had a bite of fois gras and chocolat you mention you couldn’t have!!! It’s GOOD, I felt more taste of chocolat than taste of fois gras. It’s bit not all chocolat, a bit greasy but GOOD. But why the hell not? It’s just plain fat, exactly like bacon, or even much more than bacon, since bacon still has meaty flavors, and foie gras has almost none. I am neither into any of those, but was it not David Lebovitz who was sooo amazed with his bacon ice cream and bacon this and bacon that? THIS made me always want to puke. But the tiny bit of foie gras there is not able to be even really tasted, as assured by many many many testers of this particular macaron. Again, it’s just plain fat, like butter or lard, both incredibly highly praised in this blog and elsewhere. Humm, no idea what the combination can taste like. I’d give it a go, best way to find one, and since the other ones were excellent, I’d have a tendency to trust the maker.. Maybe also because I don’t have a sweet tooth and that one of my best surprise in an Indian restaurant has been a chicken with a chocolate and chili sauce that I ordered because I wanted to discover something new. It was incredibly delicious, I would have never thought. So yes, benefit of the doubt, I’ll have it if you don’t change your mind! Oui! Oui!! I’ll bite! If you will kindly pass it through the monitor. It looks wonderful! Plus, I’d love to see how monsieur Herme handled the balance of flavors, and whether he added port, which would push it over the edge into sheer heaven for me. Where is your playful spirit, David?? I must say, I was severely disappointed when I dined at Orson in San Francisco (I just posted on it, actually), only to find they no longer had Fois Bon-Bons on the menu. That little item sounded like absolute bliss. I imagined rich, moist decadence exploding in my mouth, causing spontaneous ecstatic convulsions, like some sort of non-feigned “When Harry Met Sally” moment possessing me, that never… came to fruition. Obviously the macaron will not offer that kind of sensation, but if it has fois gras and/or chocolate, I will gladly try it. And most likely, I will like it. I wish I lived next door to you, David. I’d be there right now with my mouth full of that macaron, eyes twinkling! So… what other tasty flavors did you guys have? I have to say, I’ll try most anything. I can’t think of anything I’ve turned down outright. Perhaps this is a gastronomical faux pas, but in principle I love anything with an adventurous idea behind it, and I am more than willing to subject myself to unusual flavor combinations. And if it’s chocolate, why not? I’ll eat it! It tastes interesting in my head but hey, why not? I’ll eat anything once! Unless Pierre Herme decides to make a ketchup maca…ugh, I can’t even finish the sentence, ew. as seen in the nytimes magazine ?? Luc: Taste is always subjective, some people like green peppers, and others can’t stand them (like me). That doesn’t mean they’re good or bad. Same with bacon ice cream, and chocolate and foie gras macarons. As several people commented, the macaron sounded good to them. And if you read the post and the links I provided, I noted that I had a lot of admiration for chef Hermé and loved his other macarons, including his white truffle one. In addition to the first two paragraphs of lavish praise in this post, I often refer to him as the best pastry chef of our generation and have mentioned him frequently in similarly glowing terms. But lest anyone think that Americans are the only ones protesting against le gavage, the force-feeding of duck and geese, there’s an anti-gavage organization trying to stop it right here in France. (Warning: link contains graphic images.) I don’t buy it often but if I do buy foie gras, I try to ensure that it’s farm-raised in France, rather than raised in a factory situation. Lastly, other opinions are welcome and encouraged, and it’s okay to leave your name & info when leaving comments, rather than the link to the “anonymous” URL, even if you don’t agree with the sentiments expressed in the posts here. Actually, it’s preferable, since your comment was in the spam folder—and I pulled it out and published it. jfoureur: I haven’t had that, although I don’t get to Fauchon much. Nor do I get the NYTimes magazine, although I wish I could. Noka: I don’t think you’re weird, you’re just more adventurous than me! Autumn: Mole, at least when I make it, isn’t sweet, it’s savory. I don’t mind the combination of foie gras with something fruity (rhubarb, sauternes, caramel, or even chocolate), but I think it’s the “cookie” around it that I couldn’t get my teeth around. Literally. Hayley: I love Andrew and next time he comes, I’m taking him there, pronto! hmm… I love foie gras with groseilles, and I think it’s not a mismatch with anything sweet : onions jam, honey, other fruits as figs or grape… why not something crunchy and sweet as a macaron ? About the mix foie gras and chocolate, it’s a bit surprizing indeed but why not, again, I think I would have tried : the taste of chocolate, spiced and round and deep, I can imagine that combined with the buttery taste of foie gras, linked toguether with almonds. I tasted this macaron last year, and it was fantastic. I don’t know if I’m higher than 5 on the adventure tasting scale, but it was gorgeous. In french it was : fondant, voluptueux, sensuel. I remember coming across a cookbook in the FNAC that was all about foie gras. It had hilarious pictures of this incredibly elegant, beautiful, willowy woman in it, going to market and holding a whole diseased liver with a charming smile, then using it in various recipes. The ones that particularly stuck in my miind were the desserts. Pistachio and foie gras cookies? I love foie gras. I haven’t met a macaron I didn’t like. I’m game! You finally outdid your cod liver oil chibouste! I’m with you, David. I love foie gras, but putting it in a cookie is just a little too avant garde for me. But… but… it’s a Pierre Hermé cookie!!!! I would try it, although the look of it turns me off for some reason. And I bet it would actually go well together. How is it that you can eat squirmy things and can’t try something with chocolate in it? Squirmy things are like snot! Sea slugs? I think not. Oh lord, how naive I have been in thinking those poor fowl at least got to live their lives on pastoral French farms and only suffer the “liver treatment” occasionally. Now you burden me with the image of them corralled in factories! In my opinion, humbly of course, those consuming this delicacy should do so with their feet, well okay, shoes, for the more squeamish, nailed firmly to the floor and the “buttery, stinky, diseased” product delivered to their gullets via a large funnel. Kristina: I worked in a Southeast Asian restaurant for a few years, and I got to try a lot of unusual things. Sea slugs, once cooked, are firmer than one might think (like jellyfish, which have the texture of pickled onions!) The raw turtle eggs, though, were a different story. Once was enough with those! Vivienne: Interestingly, the Spanish have come up with an ethical foie gras that doesn’t require (or allow) force-feeding. I haven’t tried it yet. There are different ways of raising the geese for foie gras, but the factory, mass-production methods are pretty appalling and should be banned. I think you’re being very silly indeed. Foie gras is naturally very sweet. At Jean Georges I had it on brioche, with a crusty brulee coating, with a yuzu marmalade. It was AMAZING. Keller serves it with bing cherries. Sam Mason at Tailor has foie gras with peanut butter and chocolate. I would eat a whole box full of these macarons. There’s a bunch of those very same macs in the new PH miniature set.. I will definitely pass on both large and mini versions. Oh, forgot to mention. For Christmas Eve this year I’m making a pear and foie gras tarte tatin… My mom had one in a restaurant in Quebec and has been pining for it since. I would definitely have to try it. Does it sound a bit scary? Yes… but let’s be honest, foie gras is delightful with something almost “too sweet” to go with it, like a nice glass of dessert wine. How is the sugar of a cookie different? And the chocolate? It sounds decadent to me, not disgusting. One try at least… Please feel free to send some my way (in SF Bay Area). Macaron are my favorite cookie. I’m with you. I love chocolate. I love foie gras. I love macrons. But. I’m not so sure how I feel about combining all of those things. I would also consider myself an adventurous eater–unafraid of oysters, frog legs and escargot, but I’m fairly certain I wouldn’t enjoy that flavor combination. Reminds me of a less sophisticated treat from Portland, Oregon’s Voodoo donuts called the bacon maple bar. Not sure how I feel about meat and donuts either. That being said, I probably would have tried a little bit and just resisted wanting to vomir. Put me down for (1) chocolate macaron! I’ve had pan-seared foie gras with chocolate-huckleberry sauce. It was fine, didn’t get my heart racing, but that was mainly because the restaurant I was at was good but not great, and I think the combo could work in more capable hands. I don’t have to tell you, David, Mr. sprinkles cocoa nibs on pizza, that chocolate has many affinities with savory tastes! My all-time favorite foie creation is a wonderful ground candied pistachio crusted foie gras bon bon or truffle, as a passed appetizer made by Chef Daniel Patterson. Nutty, sweet, rich, foie-ey, easily picked up and eaten in one delicious bite! 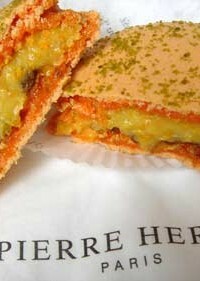 Perhaps Pierre Herme will do pistachio and foie next! And what is the famous Mole of Mexico, if not chocolate sauce with poultry? I was in Paris a few weeks ago and stopped at PH twice–didn’t see this bright red fellow either time. A big seller? I did totally love the grapefruit and wasabe macaron. I can imagine chocolate and fois gras working well together IF the proportions are perfectly done. Totally ditto. As much as I admire P.H, I too didn’t like the foie gras macaron…! I have had this piece of ‘sushi’ in Boston. I was skeptical at first, but it was the dessert portion of the omakase (chef’s tasting) and, honestly, it was wonderful. Yeah, I’ll put this on the shelf next to the bacon and chocolate combo. you are a food ignorant. chocolat is NOT for desserts only. Ask yours neigbhours the mexicains. I was offered chocolat foie gras in Toulouse. I, too, felt a bit queasy at the thought. Imagine my surprise when I actually found it to be one of the most wonderful things I’d ever eaten. 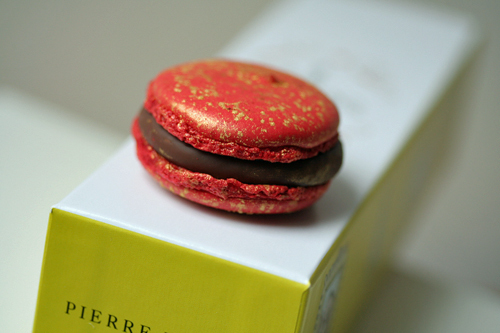 I tried the chocolate/foie gras macaron at pierre herme. It was a no-go. Wasn’t crazy about the truffle flavor either. 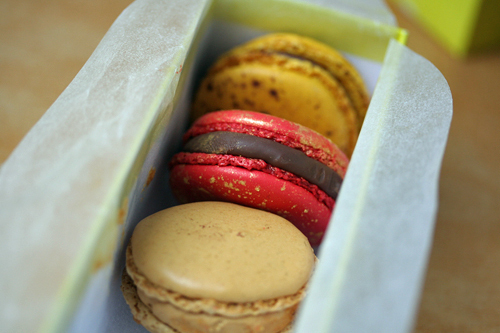 Fleur de sel Caramel… Now, that’s a macaron! Ha. Does it horrify you to wonder how an egg-nog macaron might taste? Is it completely tasteless? (No pun intended.) The idea popped into my head last night and I can’t stop thinking about it. I’m not sure though what I’d pair it with OR how to even integrate it into a recipe. I went to that Herme shop in October when I was lucky enough to go to Paris with my husband. I am going to fight the crowd when I say I did prefer Laduree’s macarons. The Herme ones were fancier, more complex, and I did enjoy them. But to sit down with a cafe noisette and enjoy? Laduree’s hands down. So, I might have tried this one when I was there, just for the experience…not sure if I would have enjoyed it though…. Well, I’m certainly with you, I’ve never met a cookie I didn’t like but just the thought of chocolate foie gas cookies makes me want to immediatly shave my tongue and gargle with Listerine! I enjoyed your story! While at the Bonaparte boutique waiting for my purchases (the ones to go home with me), my server offered me a macaron and I opted for the foie gras et chocolat since I had ordered a couple to be put in my box and I loved it! I got home – my daughter got one and the other went to husband who both enjoyed the combo – mine could be because it is PH who my husband think I am in love with. In fact, his chocolates is my favorite ones more than Rochoux whose chocolates I also buy among others. And yes, I will buy them again and again. Just a quick note to say I didn’t say anything about being “anti French” at all (!) and I certainly didn’t mean that French people eat everything and are all perfect, adventurous “foodies”! Believe me: I know how picky and “annoying” some people can be about new/different foods – French, American and others; and I also know the disgusted face of people hearing about carrot cake for the first time – when it’s so good!!! I was just very surprised that, as a foodie (like me! 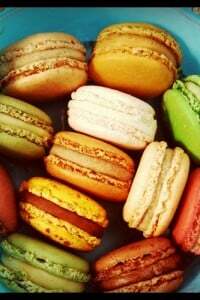 ), you didn’t try, even just a tiny little bit of this uncommon macaroon; who knows??? It might have ended up in your Top 3! But really: no big deal! As I wrote, I also understand you’re not our guinea pig and that you have your limits. PS: By the way, I had chocolate fondue with some friends last weekend and someone came with… carrots for dipping!! We all gave it a try: nothing ground-breaking, I assure you! Its look very beautiful. and I know Its taste is delicious too. ooohlala, you didn’t know what you missed. I tried this, made by Pierre Herme himself during his class in Chicago and it remains to be my favorite. It’s an unusual but awesome pairing that only the likes of PH can come up with. my assumption with chefs of this caliber is that they know what they’re doing. they certainly may make mistakes, and they certainly may produce things that you simply don’t like. but with top-level chefs, i always err on the side of trusting them. worst case: an unpleasant bite of food, max. 2 bites……..best case: an experience that totally opens your eyes to new possibilities, a revelation. you’re clearly serious about food, why would you pass this up?